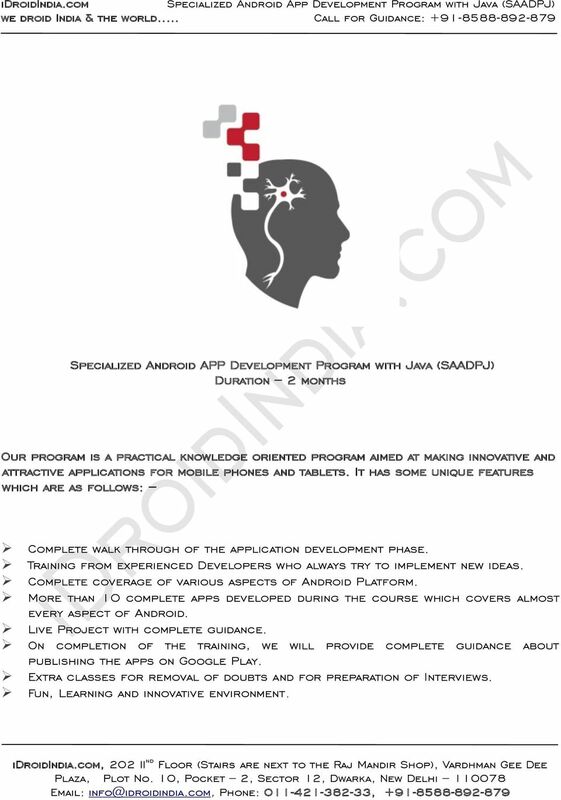 Download "Specialized Android APP Development Program with Java (SAADPJ) Duration 2 months"
1 Specialized Android APP Development Program with Java (SAADPJ) Duration 2 months Our program is a practical knowledge oriented program aimed at making innovative and attractive applications for mobile phones and tablets. 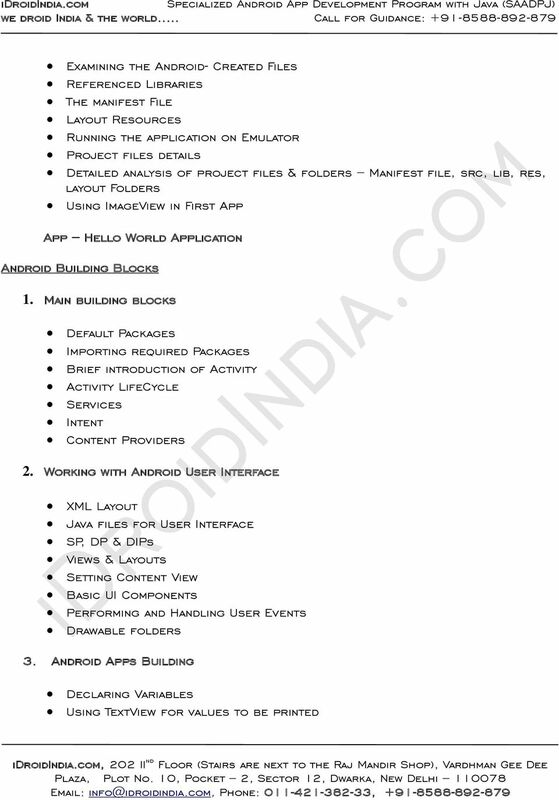 It has some unique features which are as follows: Complete walk through of the application development phase. Training from experienced Developers who always try to implement new ideas. 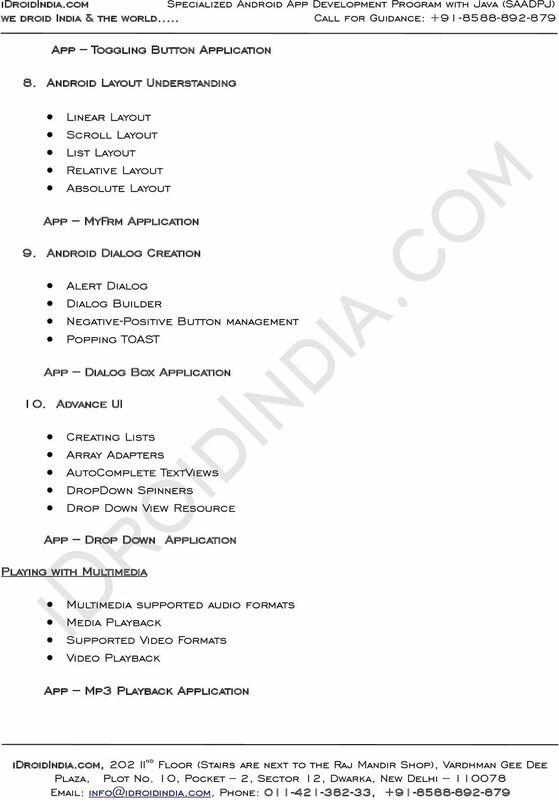 Complete coverage of various aspects of Android Platform. 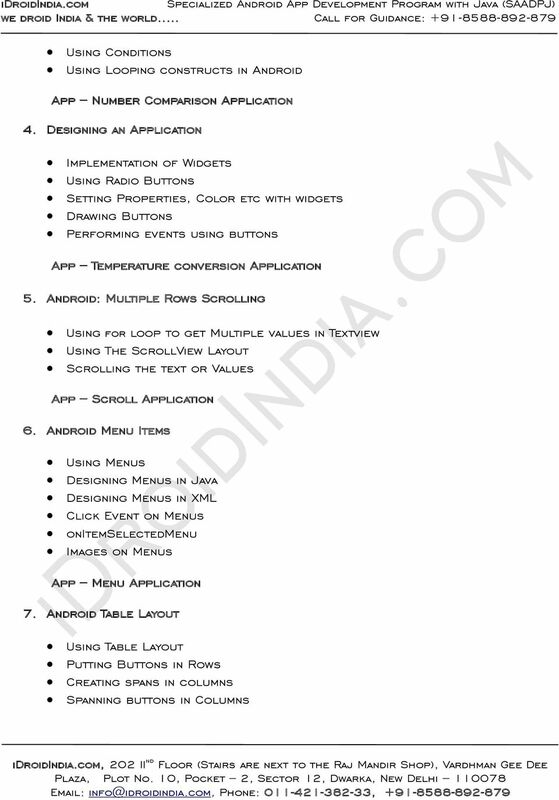 More than 10 complete apps developed during the course which covers almost every aspect of Android. 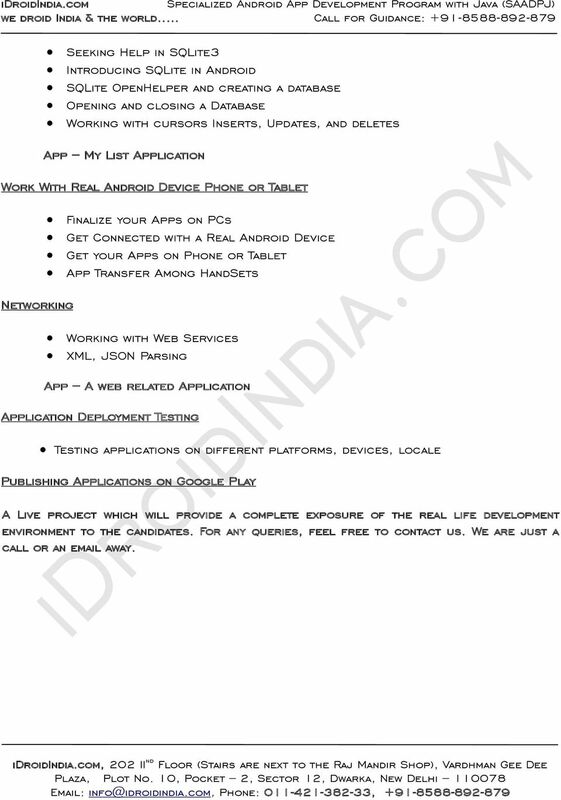 Live Project with complete guidance. 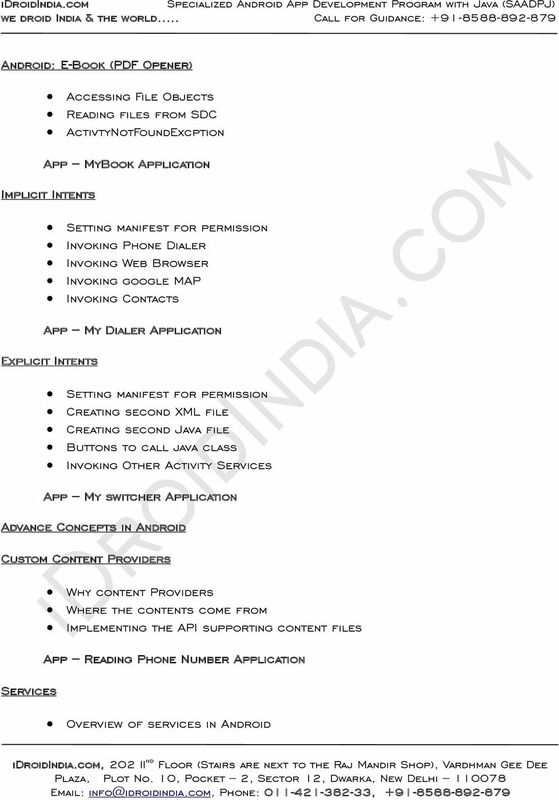 On completion of the training, we will provide complete guidance about publishing the apps on Google Play. 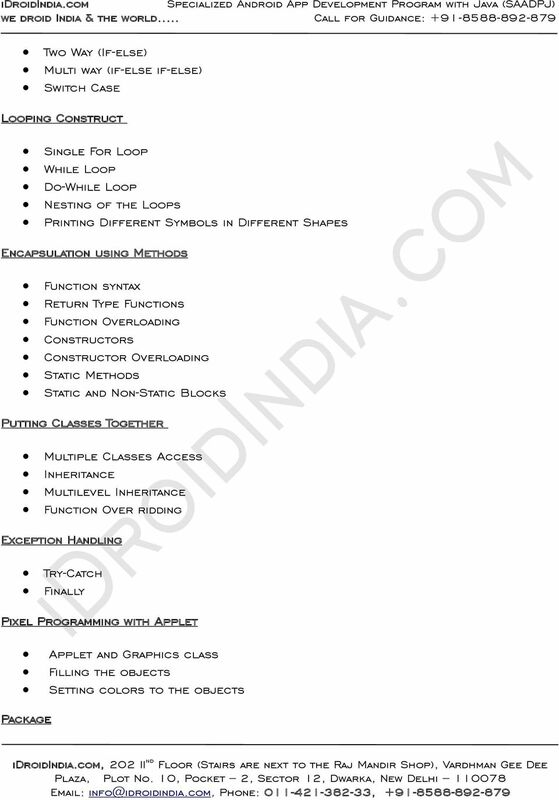 Extra classes for removal of doubts and for preparation of Interviews. Fun, Learning and innovative environment. 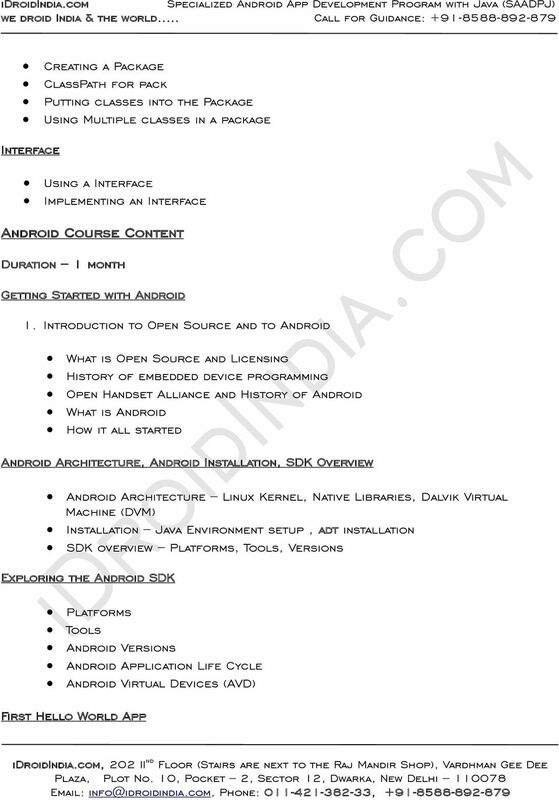 2 A brief Introduction to Android The Mobile Rockstar In recent times, Android has emerged as a revolution in mobile industry. It is owned by Google and Open Handset Alliance. 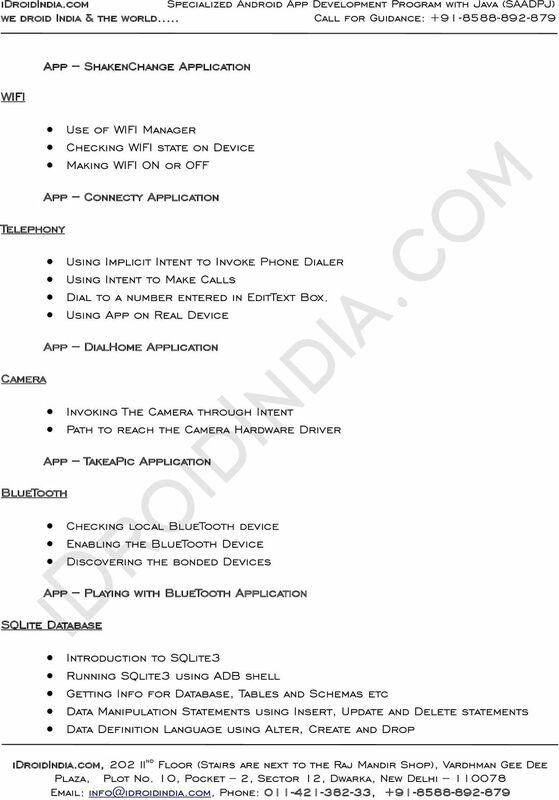 Android has set so many milestones hence it is great to learn this technology to create a promising career in it. Following are some of the achievements of Android 1. Android has market of 70.1%, where as ios has 21%. 2. 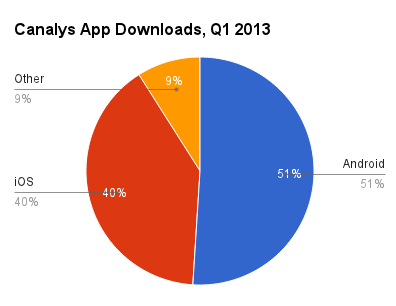 Apps download in first quarter of this year, Android has 51% and ios has 40%. 3. 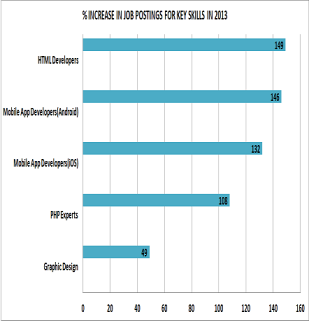 By states of Economic Times mobile developer job is expected to grow by 13% annually till 2015. 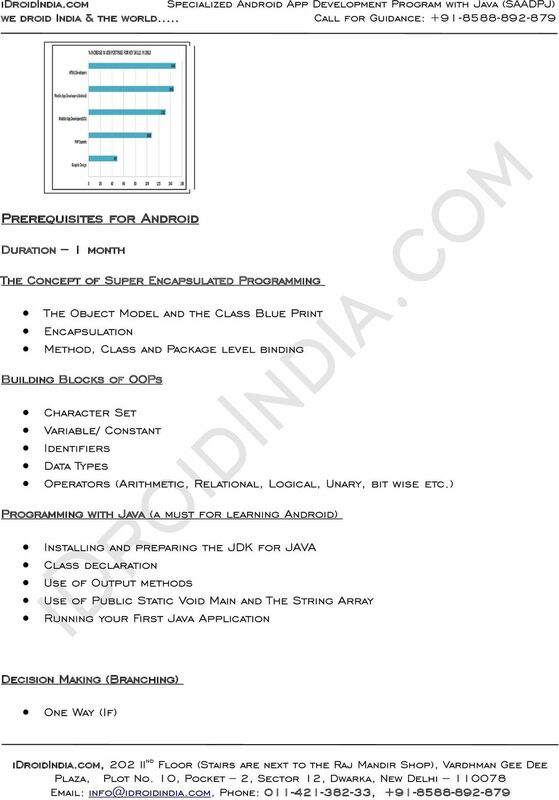 12 Seeking Help in SQLite3 Introducing SQLite in Android SQLite OpenHelper and creating a database Opening and closing a Database Working with cursors Inserts, Updates, and deletes App My List Application Work With Real Android Device Phone or Tablet Networking Finalize your Apps on PCs Get Connected with a Real Android Device Get your Apps on Phone or Tablet App Transfer Among HandSets Working with Web Services XML, JSON Parsing App A web related Application Application Deployment Testing Testing applications on different platforms, devices, locale Publishing Applications on Google Play A Live project which will provide a complete exposure of the real life development environment to the candidates. For any queries, feel free to contact us. We are just a call or an away. «compl*tc IDIOT'S GUIDE. Android App. Development. by Christopher Froehlich ALPHA. A member of Penguin Group (USA) Inc.
1. 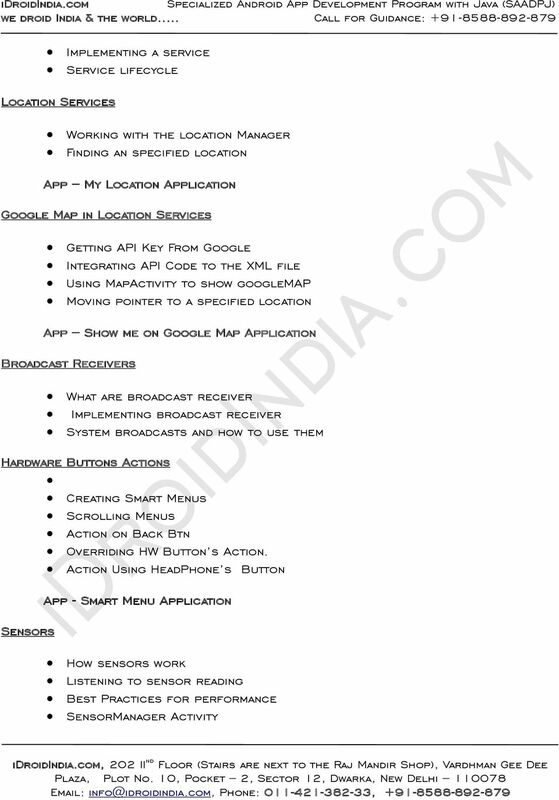 Objectives Homework 9 Android App for Weather Forecast Become familiar with Android Studio, Android App development and Facebook SDK for Android. Build a good-looking Android app using the Android SDK.